My latest travels took me back to Austria, this time for the concluding round of the two race Euro Nitro Series ‘Pilot Series’. I don’t make any apologies for the fact that onroad nitro racing is my favorite class as it was the accidental discovery of a small club of 1:8 Onroad club racing in a car park over 25-years ago that got me and my father, and then my brother, hooked on a sport that myself & my brother now have the pleasure of calling our occupation. It took a number of months of hard saving and ultimately a rather big contribution from my father to get started out with a second-hand Associated RC250 (younger readers may need to Google this high tech chassis!). Unfortunately after only a few races my Super Tigre engine, originally designed for use in an rc airplane, expired when the ends of the crank decided to have a falling out and split. With my short but very enjoyable r/c involvement now in serious jeopardy, the engine failure would actually prove to be a key moment in my professional life as with no money to buy a new one I turned to the idea of sponsorship. Picking up the Golden Pages (an Irish business directory), on my third call I struck gold with full size car battery company Exide agreeing to sponsor me a new engine and from this moment I took a keen interest in the area of sponsorship and public relations as I typed up a report, had photographs developed and posted them (no e-mail back then) to Exide and my growing list of sponsors. The experienced gained from doing this lead me to being asked to help a friend, who raced karts, to write a report for a local paper and from there I ended up working professionally in 1:1 motorsport for over 15-years before going full circle and returning to RC racing when I was asked to do some press work for VRC and Serpent in 2004. The 1:10 200mm European Championships in Madrid in 2007 would the be first event Red RC ever would attend and report on, so you can see why I will always have a close affection for onroad nitro. Anyway back to the ENS in Kirchberg, the 1:10 class attracted a particularly strong entry, helped by the fact that the Stöhr-Ring track will host the European Championships in August, and one of those was Jilles Groskamp for who the race was a start of a busy 2-month racing tour of Europe. I have a lot of time for Jilles as in the early days he was a great supporter of Red RC and was always happy to give me information for my reports as other drivers still got used to the idea of telling the media what they were doing with their cars. My most memorable moment in the sport involves Jilles when I got to share in the raw emotion of him winning his first World Championship in Heemstede at the very track where he first experienced driving an r/c car. Having not seen Jilles for over 7 months when we were in his new home town of Bangkok last November for the 200mm World Championships, it was great to catch up with the Dutchman over the weekend. After a brief time with Capricorn, Jilles is back with Shepherd and he clearly likes the family atmosphere at the German manufacturer. Flying from Amsterdam to Frankfurt rather than Austria so he could travel down in the Shepherd team van, sharing driving duties with his mechanic Alex Kempe and team boss Patrick Schafer for the close on 600km journey, he said it was a good opportunity to discuss the upcoming 1:10 European and 1:8 World Championship adding they also had a good few laughs along the way. This year the big focus for the reigning Electric Touring Car World Champion is 1:8 Onroad and the World Championships in Japan in October. Jilles was one of a small number of factory driver from Europe who traveled to the Warm-up race in May. 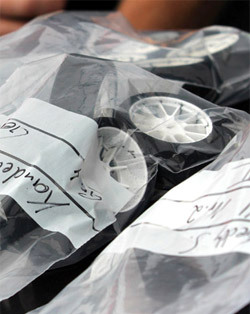 Originally expecting it to be an additive free race, as per IFMAR’s World Championship rules, he said on arrival at the track all he could see was tyres soaking in additive in pressurized boxes. Trying at first to run without additive he said there was low traction leaving him with no choice but to start treating his own tyres and while it did give better lap times he said it didn’t help much in terms of matching the locals and in-particular race winner Takaaki Shimo who he described as being in ‘another world’. Having tested back to back one brand of tyre, one set of which was acquired at the track and the other bought at a hobby shop, he said the difference was huge and expecting the tyre announcement which IFMAR made official on Monday regarding a controlled tyre provided by multiple manufacturers, he said his concern would be that one manufacturer will come up with a ‘super tyre’ for the Worlds. Mainly an electric touring car driver, a class in which controlled tyres have been the norm for a number of years, he said while he would love to only race the tyres from his personal sponsor Hot Race he thinks the single handout pre-trued tyre system he experienced on his ENS debut was the best solution for a category that has lost a lot of drivers due to the allowance of additive in recent years. While IFMAR have taken action on the tyres which we will only know whether it works or not come October, Jilles said that bodies is one area of the rules that needs to be looked at. On Day 1 of the Warm-up Race he said he destroyed 3 bodies and another 3 on Day 2 leaving him to spent the entire second evening of the event in his ‘Japanese size’ hotel room preparing more shells for the rest of the event. Stones inside the sweeper was the reason for the high attrition rate which due to the extreme lightness of the latest bodyshells meant that one mistake at the sweeper was going to cost you a bodyshell. Comparing his qualifying pace to fellow European & reigning World Champion Robert Pietsch, Jilles was happy with his performance saying that while winning on this specialist track, which all the ‘super fast’ Japanese know so well, is going to be a tall order he thinks his target of making the final is achievable. He told me one of the reasons he rejoined Shepherd was because their Velox V8 is a competitive car around the world plus he had also seen the design brief for the recently released Velox V10 PRO which he gave its first international win over the weekend. Now focused on his multiple class European tour, which takes him to Portugal next week for a few days of Electric Touring Car testing with his Tamiya team-mates, then to the UK for the 1:8 Onroad Euros, then back to Portugal for the actual European Championship beforing ending up back in Austria for the 200mm Euros, Jilles will switch all his attentions to 1:8 when he returns to Thailand. Planning to return to Japan for further testing in between he says he will do a lot of running at home with his Shepherd pointing out that running in 1:8 engines properly takes time and with a minimum of 5 units required for the Worlds its going to take up a lot of his time. Jilles will run Maxima engines named after his fuel sponsor Maxima, which is a small part of a huge company that is involved in the oil and biofuel industry. An engine tuner rather than a manufacturer, Maxima have worked their stuff on both Novarossi and OS engines with Jilles finding the OS based unit the better engine during the Warm-up saying it had both better power and better run time, two elements that don’t normally go side by side with engines. Sadly Jilles informed me that he will not make the Euro Touring Series season finale due to his participation in the 1:8 Onroad Euros marking this as the first season in the series’ six year history that the 2-time champion will not have contested a race. Jilles was the first top international driver to commit to the Euro Touring Series and was a great ambassador of the series in its early days. Another face it was great to see competing in the ENS at the weekend was Adrien Bertin. Another driver who gave me great encouragement in the early days of our event coverage, Adrien’s focus over the past number of years has been offroad but he told me that having come up with new materials that now allow Orion to make a better onroad engine than past attempts we should be seeing a bit more of the Frenchman at Onroad events. With Orion’s engine production based in Italy and him based in France, Adrien said most of his time is spent in France with him making two visits a month to the factory in Italy. With an offroad track just 8-minutes (very precise timing) from his house and two ‘nice’ onroad tracks within 30-minutes this allows him to do all the key testing himself. Adrien said it is his philosophy that his team drivers use exactly the same engines as they sell with the odd exception being big races such as the World Championship which he added are an important platform for the development of future generations of engines. A long time factory Kyosho driver, when the Japanese company decided to stop its 1:8 Onroad programme he said together with a friend he developed his own car from Kyosho parts but with no proper budget to do it right he lost his motivation. A long time friend of KM Racing owner Kenny Ng when he was approached to help the 200mm World Champions with their first 1:8 Onroad car he said he once again felt great motivation to race the class in which his true passion lies. Experiencing the car for the very first time at the Worlds Warm-up, building the car on his arrival at the track, he said they discovered many issues with the prototype but the purpose of the trip was to learn adding they ‘learned a lot’. More like a Mugen to drive than the Kyosho he was used to he said it was a case of him having to start from zero summing up the situation as being a bit like Valentino Rossi when he went to Ducati although he said he is confident the KM car is a lot better than the bike! Describing the grip & asphalt of the Keitune Racing Speedway as very special and it is the home of Mugen and ZAC tyres, Adrien thinks that combination is going to be very hard to beat there. The only driver to have won both the 1:10 & 1:8 World Championship, he will have another opportunity to race at the track when he returns to Japan at the end of August for a race KM Racing are putting on and which is set to attract a number of key international entries. Racing 1:10 Touring Car at the ENS, Adrien said the level of competition in the class is now very high with the drivers forced to always find something better with the cars and engines to try and get the smallest edge over their rivals. Unfortunately a fuel tank issue meant a disappointing result but he said he learned a lot of valuable information for the European Championship. I had an interesting chat, well lets call it more a debate than a chat, with Mr. Capricorn Patrizio Rossi on Saturday. Patrizio is well able to get his point across as highlighted by the fact that he somehow managed to get his driver Francesco Tironi into the Semi Finals of the 200mm World Championship as an 11th car from where he went on to progress to the main and finish on the podium. With 9-time World Champion Lamberto Collari signed to his team, I was interested to know why Capricorn didn’t attend the Worlds Warm-up Race and the answer I got was straight to the point, the ‘lack of clarity on the tyre rules’. Patrizio, who like myself sees 1:8 Onroad as the Formula 1 of rc racing, said there was little point in traveling to Japan to race in completely different conditions to what will be permitted in October. 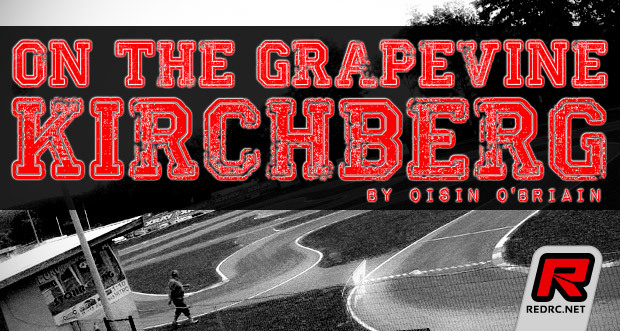 Aware of the pending IFMAR announcement regarding tyres for the Worlds, he feels this is good for everyone involved. The tyre companies get to compete against one another helping with product development and can promote their successes something which is pointless if you are the sole supplier. Drivers also have the choice to race a tyre that they have experience of rather than having a particular brand forced upon them. Funny during our debate the reference to Formula One and its having just one tyre supplier came up a number of times, this was all before the Pirelli drama that would unfold on Sunday afternoon at the British Grand Prix. With the Capricorn team leaving straight after the 1:10 final as they had a 700km driver back to Italy ahead of them, on hearing the news from the Grand Prix I sent Patrizio a message suggesting that set up a meeting with Bernie and share his tyres ideas with him!!! While they opted to skip the Warm-up Race, Patrizio will take his big name team of Collari, former 1:10 World Champion Daniele Ielasi and Dario Balestri to the KM Race as their Worlds preparations. Having been told many years ago by a manufacturer that signing Collari was not an attractive proposition because if he switched and didn’t win people would say it was because their chassis was not up to the job. 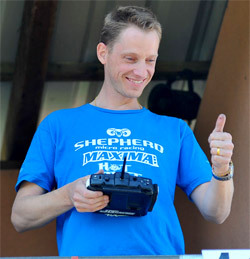 While the circumstances are a little different now, Kyosho leaving the class and Collari not the current World Champion, Patrizio said this year can only be better than the last one for Collari and if there is ‘no rain’ he is confident they have a very good chance. His ‘no rain’ reference was to the fact that had rain not caused the race in Miami to be shortened he believes Balestri would have caught & passed Pietsch for the win. Interestingly with KM Racing entering the 1:8 market I asked how this effected his deal with Balestri, who is a factory KM driver in 1:10 and a Capricorn driver in 1:8. Patrizio said when the current contract is up Dario must decide to go all Capricorn or all KM Racing. During our conversation the might of Novarossi in the world on nitro racing came up with Capricorn’s Francesco Tironi having to get permission from the famous engine producer to miss a 1:8 Italian National so he could attended the ENS, of which Novarossi were one of the main sponsors. Have an opinion on the topics discussed? Leave them in the comments below. 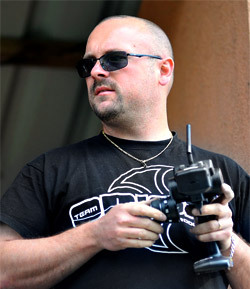 Oisin O’Briain is Red RC’s Event Editor. Traveling the world reporting on some of the biggest races in the sport he regularly chats with top drivers and key industry figures and in his new column ‘On the Grapevine’ he will try to bring readers an insight into the latest talk that is doing the rounds in the paddock along with the odd bit of trivia information that comes to light. The views and opinions expressed in this column are those of the author.